So happy to report that this big project is out of the way. On Saturday, we gathered a crew of workers together and made some important upgrades to greenhouses 6 & 7. This really needed to be done before the real cold sets in. The plastic on greenhouse 7 had ripped and was tearing away from it's east end frame and was in need of replacement due age and general wear and tear. We covered it with a "new" piece of plastic that was recycled and salvaged from a larger piece of plastic that tore off an even bigger greenhouse. Greenhouse 6, aka "the big tomato greenhouse", finally got it's second layer of plastic as well. This is a project we started in the early spring, but the company sent us a piece of plastic that was 8 feet short. Then by the time the replacement roll came, we were swamped with planting and other projects. The second layer will help keep things growing longer into fall. Camomile - this is another specialty crop we are growing for Chef René at The Rose in Jackson Hole. It's grown very well for us and we easily have enough to harvest some for our CSA shares this week. Camomile can be used in many ways, fresh or dehydrated. One of the most common uses for this herb is to make tea. You can toss a portion of the flowers and stems into a gallon glass jar with a few tea bags, fill with water and leave out in the sun to steep. Or do the same with hot water. Both the flowers and stems are edible. Flowers can be placed as an edible garnish or chopped up fine and sprinkled on salads or other dishes. The stems can also be used, but more commonly only steeped in oils, wine, vinegar, water or other mediums to extract the flavor. In my quick research, I also saw several on line recipes for baked goods like camomile breads, cookies, pastries etc. Experiment and let us know what you make. Cilantro flowers are also edible. They can be used (fresh or dehydrated) the same as how you would use the regular cilantro leaves, but the flavor is more mild. The delicate white flowers can be used as a garnish on a salad or other dish. You can also steep the flowers (stems and all) in oils, vinegar, and dressings for a mild cilantro flavor. We appreciate feedback on adding these and other trial crops to the CSA shares - did you like the bronze fennel ferns, camomile, cilantro flowers, red veined sorrel in the salad mix? Word from the Workshares is they like trying the new items. We hope you are too. We are loving the French Fillet Beans this week! They are a personal favorite! I love to eat them raw, dipped in pesto! If you cook yours, keep in mind they are very tender (will cook fast) and are best left a little more crisp than to over cook and go soft. Yes, it froze last night at EverGreen Farm. 32 or below with noticeable frost on the cars and lawn. We anticipated this happening and took extra precautions. (Tuesday was a VERY long day.) We had out every row cover we own and even cut extras off a new roll. Everything was covered and will be covered for the next few nights. Squash and zucchini plants took to worst of it (again), yet they still produce a little each week. Our precious tomato, cucumber and basil plants all did fine. The outermost leaves on the bean plants looked like they could have froze, but the insides are loaded with blossoms. Didn't have time to check the potato plants. Some new items in your share this week - radicchio and bronze fennel fern. Bronze fennel fern is an herb that we are growing this year for a restaurant. The ferns grow very well and we currently have a little extra so it's a nice thing to share with our CSA members. The ferns can be in many ways. They can be added to salads, used in fish or egg recipes (as you might use dill), chopped and added to ground sausage, to make seasoned vinegar or olive oils, added to pickling recipes, and steeped for tea (fresh or dried). Let us know what you think. Radicchio is typically known as a bitter, spicy green. This is another crop we are doing as a trial for a restaurant. Over time, the leafy greens are supposed to develop into heads, but our extreme heat/cold fluctuations seem to be too much stress and they are going to seed before forming heads. So, we took out a row this week for our CSA members before they went to waste. (They probably wouldn't have done well with the freeze we had Tuesday night anyways.) The leafy greens can be added to your salad mix with the intense flavor being offset by a sweet honey dressing. Again, let us know how you like it. Or not. Next week we'll be picking our famous French fillet beans! 78 pounds of Sugar Snap Peas! It's been a very busy, bountiful week on the farm. It's the first week of the season when Farmer Shain's "These items are ready to harvest" list was longer than what myself and Workshare crew could expect to accomplish. So, it was all about priorities and scheduling. I had 3 top priorities this week - the snap peas, garlic, and golden beets. All are in this week's share with our other usual farm offerings. We knocked out a big project on Monday afternoon by getting all our sufficiently dried garlic chopped off their stocks and into bushel baskets, sorted by size, and then bagged up for the CSA shares. Music this week, German next week. We are keeping the biggest and best to replant for next years crop, with the hopes that all these years of effort and patience will finally get us back to the size and quantities we grew many years ago. Hoping BIG here too. A recipe shared by CSA member Renee for Zucchini Waffles (from the mylifecookbook.com website). She says they are a big hit. Too bad our zucchini crop took a beating when it froze a while back. Looks so yummy! EverGreen Farm is looking for some new Workshare help for the remainder of the season. Come help one harvest morning a week and receive a CSA share for free. We harvest every Monday, Tuesday, and Wednesday mornings. With school starting again, we will also be working many Friday or Saturday mornings (to accommodate the schedules of people working for the school district). Work hours are typically 7 am to 12 noon, while we have a bounty of food that needs to be harvested each week. We will cut back to 4 hours per week when things slow down again (usually around the end of September, first of October). One of our Workshare crew members has stopped coming to help on the farm due to health concerns. If you know anyone who would like to join us for the rest of the season, please have them get a hold of me. We are looking for someone who can help harvest on Monday, Tuesday, or Wednesday mornings. Soon, when school starts, we'll also be working many Friday or Saturday mornings. We are coming into the most bounteous part of the season, so this is a great time to join EverGreen Farm. Freeze damage to our kale and squash plants. Our big news of the week is the unfortunate freeze of August 4th. We had been watching the forecast carefully, with an eye on how cold it might drop on Wednesday night. It bounced around a bit. 30. 32. 30. 34. 34. 34. So, with the threat of a freeze we did the usual - row covers on all sensitive crops (tomatoes, basil, peppers, cukes, beans, zucchini, squash, etc.) and closing ALL greenhouses up tight. It was a real disappointment to go out on Thursday morning and see the results of what was more likely a drop of temps down into the 20's. Our squash and zucchini plants took a real hit, despite being in a greenhouse and under a thick row cover. You can see in the photo above how the upper leaves were killed off. Underneath are still many little yellow blossoms and tiny fruit. This kind of stress is likely to slow down the heavy production we typically enjoy through the end of summer, but I like to think that the little yellow blossoms are telling us to not give up on them just yet. The other surprise was seeing the rows of badly frozen leafy greens in greenhouse 3 - our kale, collard greens, Swiss chard, and cabbage plants. This type of damage doesn't usually occur with just a mild frost. It had to have gotten much colder for these hardy greens to die off. We decided it would be best for the plants if we picked out all the dead leaves in hopes that the smaller, inner leaves would rebound to bring us more weeks of harvest longer into the season. This has taken precious time, but it's probably worth it. Our potatoes also took a pretty bad hit. Farmer Shain has been saying for weeks that it's been one of our best years for growing potatoes. We had covered the rows back in June when it threatened to freeze then left the row covers on for another cold night a week or so later. Leaving the covers in place all this time really accelerated the growth of the plants and we had high hopes for increased yields underground as well. But after last week, where about 50% for the upper leaves are now dead, Shain is just hoping for a decent harvest. We'll have to wait and see. We don't dig potatoes until a hard freeze kills off the plants entirely. Otherwise, I'm happy to say there was only minimal damage to any other crops. Oddly enough, the peas we picked for this week's share were fine - growing outside, uncovered, and just a dozen or so yards away from the potatoes. Salad greens also came out fine, just took a little extra time to clean up, but it was worth it. No real damage to our beloved heat loving crops growing in greenhouses 5 & 6. 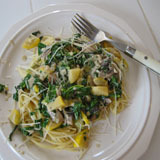 I'd love to share pictures of the meals you are making with your veggies, or recipes. Send them to me by email. Our big news of the week is that our 8 rows of garlic are out of the ground and hanging in the shed to cure! We got half out on Friday evening and the other half out on Saturday morning. Thanks to all the helpers that came to assist with this big project! I'm happy to report that this year's garlic crop looks great! We have had several years of problems and disappointment with our garlic. Not this year. Only minimal rotten bulbs and quite a bit of it is a nice big size. We are growing two varieties, Music and German Extra Hardy. We will give about a pound of both to our CSA members and save the rest to replant in an effort to rebuild our stock back to where it was a few years ago. It's our goal to build back up to the overall size and quantity of garlic we were growing years ago. *We are growing two varieties of kale this year, Red Russian and Tuscan. The frilly Red Russian Kale grows very well for us, a prolific crop that does well in the cold, not too buggy, and over all is easy to grow. However, Farmer Shain prefers the Tuscan Kale so he's seeing how it does on our farm. So far, the half row we planted in a greenhouse is growing well, though maybe not as bounteous. Shain thinks he's decided to go with the Tuscan variety only next year. Opinions? Let us know if you have a preference. 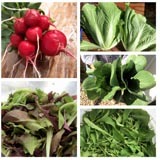 **This week's salad mix has two additional ingredients: Red-veined Sorrel and Chicory (aka Italian Dandelion). This idea stems from my spending a morning working side-by-side with Chef René Stein and is inspired by a salad he is currently serving at The Rose in Jackson Hole. The taste of these leafy greens can be described as zingy, spicy, bitter, and savory. These flavors pair well with a sweet dressing such as this Honey Vinaigrette recipe, also provided by Chef René. Let us know what you think. New layer of mulch in greenhouse 5. One of Farmer Shain's big priorities this year is getting fresh mulch and compost into the greenhouses. This is greenhouse 5, the "small tomato greenhouse", with a new layer of compost down the rows of bush tomato plants. A layer of grass clippings is also being laid down each row. This compost "recipe" will breakdown over time to make a wonderful, rich soil. And it will also help block out weeds. Carrots are on the harvest list for next week. Golden beets the week after. Hoping there will be enough onions for everyone next week. Lot's of food coming soon.